Our Investment Strategy - Rich Investments, Inc.
Rich Investment’s Inc. uses a strategy that is evidenced based and rooted in academic, investment science. We use scientific, engineered portfolios that incorporate asset classes from around the world in order to offer our investors the opportunity to fully participate in the global capital markets. 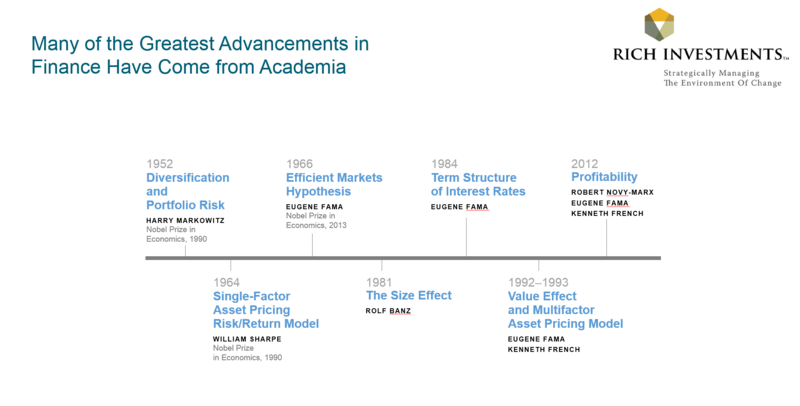 Our selection of asset classes is largely influenced by the research of Nobel laureate and Professor Eugene Fama, Sr. (University of Chicago) and Professor Kenneth French (Dartmouth College). Decades of investment science research have identified that both risk and return are related and that there are factors of higher expected returns in the global capital markets. Portfolios can be structured around these factors, which are sensible, backed by academic, investment research, and cost effective to capture in diversified portfolios. We intentionally build our portfolios to take advantage of risk that will compensate our investors with higher expected returns and we eliminate risks not worth taking through comprehensive, global asset allocation. We do not market time, speculate, nor try to guess the future. Our approach ignores the main stream/Wall Street media and instead gains insight about the markets from academic research relying on sound, scientific fundamentals to guide the process.